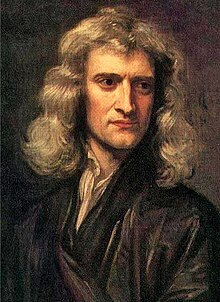 Sir Isaac Newton (25 December 1642 – 20 Mairch 1727 bi the Julian calendar in uiss in Ingland at the time; or 4 Januar 1643 – 31 Mairch 1727 bi the Gregorian calendar) wis an Inglish pheesicist, mathematician, astronomer, philosopher an alchemist that wrate the Philosophiae Naturalis Principia Mathematica. In it he descrieved universal gravitation an, throu his laws o motion, laid the foonds for classical mechanics. Newton wis the man that developed the differential calculus an aw daein sae thirty year afore Gottfried Wilhelm Leibniz that aften shares wis the first tae mak a set o mathematical laws that coud predeect baith ordinar motion an celestial motion. He is associate wi the scientific revolution an the forder o heliocentrism. Newton is creeditit forby wi providin mathematical substantiation for Kepler's laws o planetary motion. He wad rax thir laws bi shawin that orbits (sic as the orbits o comets) wisna juist elliptic, but coud be hyperbolic an parabolic an aw. He is kenspeckle for his arguments that licht wis componed o particles an aw. He wis the first tae feegur that the spectrum o colour seen whan white licht passes throu a prism is inherent in the white licht an no eikit bi the prism as Roger Bacon haed thocht in the 13t century. Forby thon Newton developed a law o cuilin, descrievin the rate o cuilin for objects whan exposed ti the air; the hale binomial theorem; an the preenciples o conservation o momentum an angular momentum. Finally, he studied the speed o soond in air, an spak aboot a theory on the oreegin o starns. Newton's laws o motion an gravity gied awbody the foonds for spaein mony sindry scienteefic or ingineerin situations, especially the motion o celestial bodies. His calculus pruived gey important ti the oncome o further scienteefic theories. Finally, he pit mony o the aesome pheesics facts that haed been discovert afore thegither intil a saitisfeein seestem o laws. For this, he is conseidert ane o history's greatest scientists, rankin abuin sic feegurs as Einstein an Gauss. John Maynard Keynes, Essays in Biography, W W Norton & Co, 1963, paperback, ISBN 0-393-00189-X. Keynes haed taken a close interest in Newton an owned mony o Newton's private papers. Isaac Newton (1642-1727), The Principia: a new Translation, Guide bi I. Bernard Cohen ISBN 0-520-08817-4 Varsity o Californie 1999 Warning: common mistranslations exposed! Stephen Hawking, ed. On the Shoulders of Giants, ISBN 0-7624-1348-5 Places selections frae Newton's Principia in the context o selected writings bi Copernicus, Kepler, Galileo an Einstein. Wikimedia Commons haes media relatit tae Isaac Newton. Newton's Theorem: Newton's line in a circumscribed quadrilateral. bi Antonio Gutierrez frae "Geometry Step by Step from the Land of the Incas"